Current facade of 165 Columbia Heights. Credit: Google. The Commission expressed concerns over proposal but approved reconstruction of building’s long-stuccoed brick facade. 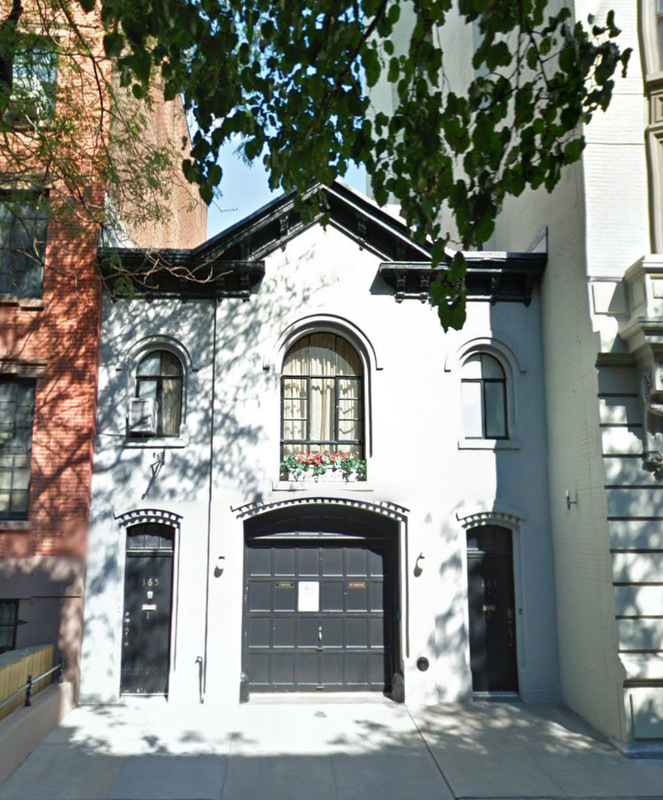 On February 26, 2013 the Landmarks Preservation Commission voted to approve a proposal to reconstruct the facade of an 1880s carriage house at 165 Columbia Heights in the Brooklyn Heights Historic District. The two-story structure, converted to residential use in the early 20th century, had its original brick facade covered with stucco in the 1930s. The building is owned by the George and Anita Driscoll Feiger Living Trust, which purchased the property from the Jehovah’s Witnesses organization in 2012. Architect Ann Krsul of Krsul + Viederman Architects, presented the proposal, which she said would restore the building to its historic condition. The plan is to remove the front facade and reconstruct it without stucco, using salvaged brick from the original facade, if possible. Krsul explained that the original brick beneath the stucco had been scarified so the material would better adhere, so they hope to use the reverse side of the bricks on the building’s face. If the existing brick proves to be unsalvageable, the applicants intend to use salvaged bricks from another site to maintain the historic quality or use commercial brick closely matching the original. The brick detailing of the original facade would be retained, using the original brick, as Krsul believed the ornamental features were not scarified. In response to the Commissioners’ questions, Krsul stated that conservators from Highbridge Materials Consulting and 2 ARTS Conservation would assist in the brick’s restoration. The applicants would also seek to recreate the era’s original mortar recipe for the new facade’s mortar and pointing. Steel window frames in the front facade would be replaced with wood, as they were originally. Openings on the rear facade would also be reconfigured and larger windows would be created. Krsul noted that none of the work to the rear could be seen from a public way and little would be visible to neighbors. Commissioner Fred Bland approved the proposal. He stated that there was a “fine line” between restoration and “Disneyfication,” but he noted that the applicants had an appreciation for this type of architecture’s “great legacy.” He also added that the existing stucco cladding was “without style.” Commissioner Libby Ryan concurred, stating she was convinced that the applicant was “fully aware of the implications of removing the entire facade.” She was particularly impressed by their analysis of the historic mortar and their willingness to replicate it. Commissioner Michael Goldblum said he was troubled by the proposed “skinning it and rebricking it,” but was persuaded by the “technically-focused” applicants. Commissioner Margery Perlmutter, who did not vote on the proposal because she missed a portion of the presentation, argued “in policy” against wholesale demolition and replication. Chair Robert B. Tierney agreed with the bulk of the Commissioners’ comments, adding that “caution must be observed.” The Commissioners unanimously voted for approval. LPC: 165 Columbia Heights, Brooklyn (13-9439) (Feb. 26, 2013) (Architect: Krsul + Viederman Architects).